As a follow-up to the horror stories about the charges incurred by users of Indianapolis' BikeShare program run by the Indianapolis Cultural Trail, Inc. (ICT), I decided to take a look at the contract that riders are asked to sign. 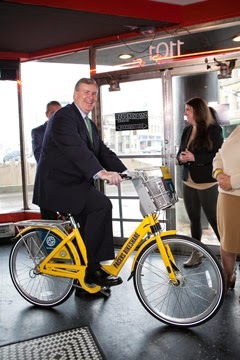 After reading the contract, which is published on the Indiana Pacers BikeShare website, there is no way I'd take the risk of ever checking out a bike. 2.6 Maximum Rental Time and Charges: The maximum rental time is 24 hours. Rider agrees that Rider will return the Bike to a designated ICT, Inc. bike station within no more than 24 hours from the time that rental of the Bike began. Rider may then rent again. Rider agrees that he/she is solely responsible for being aware of any elapsed time related to the timely return. Bike Rental Charges are $8.00 for a 24 hour pass and $80 for an annual membership. For bikes checked out between 31 and 60 minutes, a $2.00 additional user fee will be charged. For each 30 minute period greater then 60 minutes, an additional user fee of $4.00 per thirty minutes will be charged. The maximum day charge is $75.00 and is based on a calendar day. The claim may well be that other published material given the bikers impose the 30 minute check-in requirement and higher daily charges. The problem with that argument is that the Agreement contains an incorporation provision which says the document represents the entire contractual agreement between the parties. If a bike is not shown as returned within 24 hours, Rider is charged $1,500. (Section 2.6) That is far above what the bike is worth. It's important to remember too that they have your credit card information and will likely just charge it. It is a violation of the Agreement to use the bikes if you have consumed any alcohol or drugs, apparently even legal prescription drugs (Section 2.9) Forget having a beer with your dinner if your on a bike. Rider is responsible for paying for all repairs need to the bike. (Section 2.13) Conceivable a Rider could be billed for repairing even a flat tire. Rider agrees he or she "will have no right to make a claim or file a lawsuit against Released Parties arising out of this Agreement, the rental, maintenance, design, use and/or operation of the Bike, the Indianapolis B-cycle program, Indiana Pacers Bikeshare and/or this website, in consideration for using and/or operating the Bike." (Section 3.3) So forget suing to try to recover that $1500 they charged you on your credit card for a bike you returned but was shown as missing on their records. I doubt there are many attorneys who would encourage their client to sign such a one-sided agreement in order to rent a bicycle. The bikes & concept are cool. But we're no longer suggesting them to guests, due to fee trapping; which is hostile outsider treatment- not guest welcoming. Who wants to explain that noise? It's easier to direct friends to one of a few in town outfitters with fee simple arrangements. The concept is viable however; if they'd eliminate traps & replace them with service. It can't be that hard.